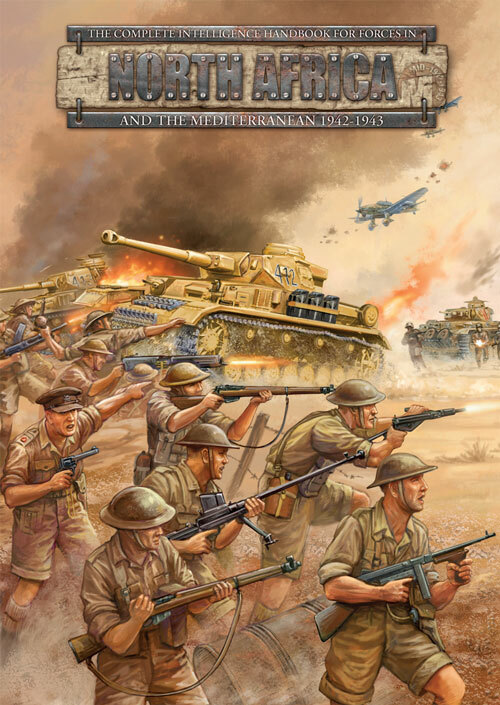 Like many great battles of WWII the Battle of El Guettar is not just one encounter between Allied and Axis forces fought on a particular day, but is in fact somewhat of a focal point in Patton’s offensive beginning 17 March 1943. 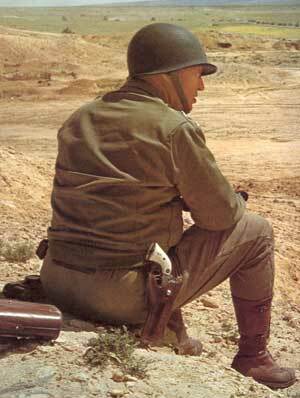 On March 9, 1943 General George S. Patton took command of the US II Corps from General Fredendall who had been in charge during the disaster at Kasserine Pass. His first move was to organise his Corps ready for an offensive toward the Eastern Dorsal, a range of rugged hill separating the Allied forces from Tunisia’s eastern coast. II Corps were positioned around the Western Dorsal straddling the Algerian border, which ran north to meet the Eastern Dorsal inland from Enfidaville. 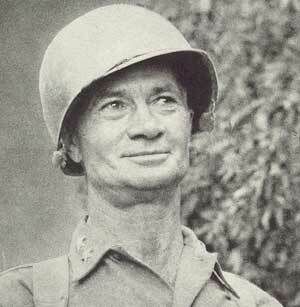 Under his command was “Old Ironsides” 1st Armored Division, 1st, 9th and 34th Infantry divisions. He quickly whipped his men back into shape, enforcing dress regulations, which included the wearing of neckties, and generally ensuring discipline and order were kept. On March 17 his troops were thrusting towards the Eastern Dorsal, Old Ironsides were sent towards Maknassey, 1st and 9th Infantry towards Gafsa and the 34th on to Fondouk. The 1st Infantry Division had taken Gafsa and El Guettar by March 17. The first Battle at El Guettar occurred on March 23. Tanks of the 10. Panzerdivision, supported by Panzergrenadiers and also Italians from the Centauro Division, attacked the positions of the 1st Infantry Division around El Guettar. The Axis troops' attack was aimed at clearing the pass. At 0600 hours (6am) fifty tanks of Broich’s 10. Panzerdivision emerged from the pass on to the dusty El Guettar valley, they were followed by Marders and Panzergrenadiers. German Aircraft buzzed overhead. The Germans quickly overran some front line infantry and artillery positions. 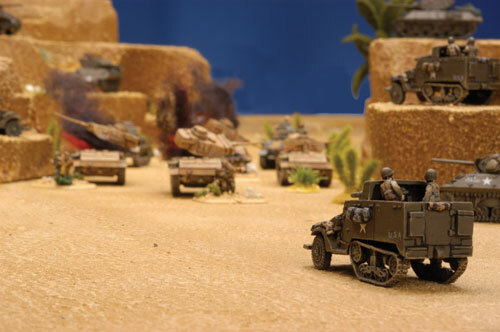 The Germans initial success soon ran into trouble when their Panzers ran into a minefield concealed in a wadi, it was then the US artillery and anti-tank guns opened up, among them were 31 M10 Tank Destroyers of the 776th Tank Destroyer Battalion. Also present were the 601st Tank Destroyer Battalion, though they were still armed with the 75mm M3 GMC they had arrived in Africa with. The 10. Panzerdivision left thirty of its precious Panzers in the valley of El Guettar and by 0900 hours (9am) the remainder of the attacking force had pulled back to reorganise. The Axis had not finished, another attack was launched at 0445 hours (4.45pm), and this time the infantry were on foot spread out among the Panzers. The artillery men were well prepared and made easy targets of the advancing Grenadiers. During the battle the Tank Destroyers were in action again supporting the artillery firing HE at the advancing German infantry. 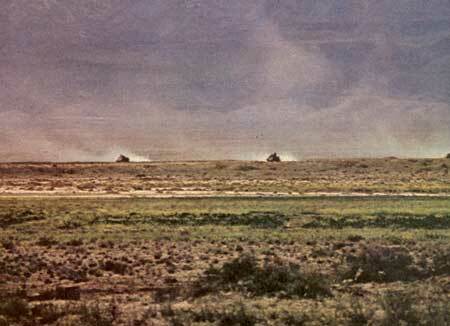 One platoon of Marders fleed the field when faced with “tanks”. The defenders drove off the attacking 10. Panzerdivision forces back through the pass where they soon retired on Gabes. The Tank Destroyers suffered heavy loses, 21 of their 31 M-10s were disabled, though eight were quickly recovered from the field and repaired. Patton’s advances had achieved some success in southern Tunisia, and he soon received an order form British General Alexander (the US II Corps was operating directly under the British 18th Army Group, which also included the 1st and 8th British Armies, and the French XIX Corps) to increase pressure along the Gafsa-Gabes axis. The 1st and 9th Infantry divisions were to attack along the Gafsa-Gabes axis with the aim of opening the pass located north of Hill 369 so Old Ironsides could attack on the 27 or 28 March. The first phase of the offensive would require the securing of the road junction north of Debel Berda and surrounding ridges and hills. 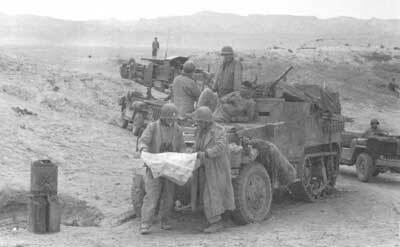 Following the completion of this task they were to push on to fully secure the pass so the 1st Armored could push on to attack the Axis positions on the western flank of the Wadi Akarit, north of the Mareth Line. 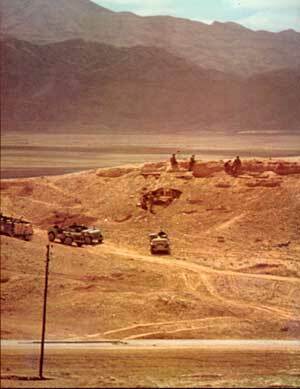 The 1st Armored was to then advance through the pass to Djebel Tabaga Fatnassa on the west flank of Wadi Akarit. The remainder of the II Corps, including units of the 1st Armored, were assigned other objectives. Combat Team 60 of the 9th Division, with elements of 1st Armored attached, was to secure the pass east of Maknassey; the 34th Division was to do the same east of Fondouk. 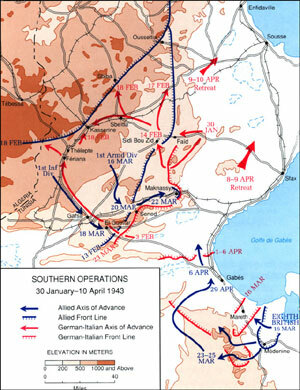 On 28 March the 1st and 9th Infantry divisions launched attacks to take the road junction and pass 10 miles to the east of El Guettar. 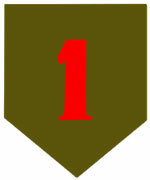 The 1st Infantry Division were now well used to the conditions of combat in North Africa, but the 9th had yet to see combat and this showed in the performance of the two divisions. The 1st ID immediately secured the dominating terrain (Hill 482), taken with a pincer move by its two infantry regiments, and then went about slowly moving forward pushing enemy from their positions. The 9th ID immediately formed its infantry into a column of four battalions and attacked their objective, Hill 369. The leading battalions came under withering fire, while the two trailing battalion became confused and lost in the rugged terrain. One company was ambushed in a dead-end of a ravine and wiped out, the rest of the two battalions lost total contact with the division for 36 hours. 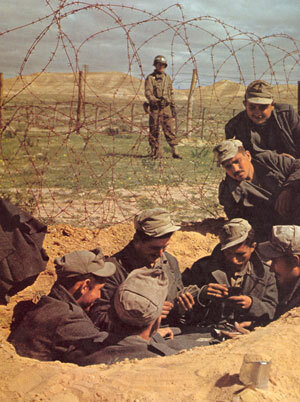 Inexperience was partially to blame, but inaccurate maps also played a part (front line locations were later established using artillery flares). The leading battalions from the 47th Infantry Regiment established positions on a ridge (El Hamra) in front of Hill 369, no further movement was possible with Axis fire hailing down on the 47th’s position. General Irwin (commanding the 9th) now felt the need to send in some of his reserves. He called up the 2nd Battalion, 39th Infantry Regiment. On the 29 March under the cover of night the Battalion was to frontally assault the enemy positions astride Hill 369 from its northern slope. They approached their start positions in trucks, but due to bad reconnaissance were caught under heavy fire from fortified positions on Hills 290 and 369. Heavy casualties from the fire disorganised their attack and they withdrew to their original position. Despite the slow progress of the 1st and 9th Infantry Divisions, General Alexander was keen to apply pressure from their direction to stop the Axis forces reorganising around Wadi Akarit after the 8th Army had broken through the flank of the Mareth Line. He ordered Patton to attack with Benson Force (one Combat Command of the 1st Armored Division) through the 1st and 9th positions on 30 March. Alexander’s decision was based on strategic considerations; no account was taken of the situation on the ground around the 1st and 9th Infantry divisions’ positions. The Italians and Germans still held strong positions in the high ground around the El Guettar valley; the dusty plain was still covered with minefields and well situated anti-tank gun positions. The enemy tank numbers were still high, both the 10th Panzer and Centauro Divisions still had reasonable numbers of armoured vehicles. Benson Force first attacked on afternoon of 30 March, but ran into mines and anti-tank fire. They lost 5 Tanks in the process. On 31 March at 0600 hours they attacked again, this time supported by the infantry of 3rd Battalion, 39th Infantry Regiment. This assault was more successful and over seven hundred prisoners were taken in the process. The ground gained could not be held and sustained casualties force Benson Force to retire at 1245 with the loss of nine tanks and two tank destroyers. Another attempt was made on 1 April, but little was gained. Alexander at the 18th Army Group realised the armoured break-through was not working and ordered the push to resume with the infantry to complete the first phase of the original plan. But before the initial phase could be completed orders were received to start the second phase of the operation. As the Axis still held the vital Hill 369 that was the objective of the first phase, Patton puzzled how he was going capture the next objective, the road junction, ten miles beyond that? The 9th ID now switched their attack from Hill 369 to the dominating terrain in the area Hill 772. Fighting continued, but the 9th made little progress, while enemy fire remained heavy. In the meantime the 1st Infantry Division slowly progressed along the parallel ridgeline to the north of the road. The 1st Infantry Division took their objective on 3 April, though the 9th was still engaged in a struggle for Hill 772. The Axis commander in the area Italian General Messe sent in re-enforcements from the 21st Panzer Division further delaying progress by the infantry. By 6 April the situation had changed little with less offensive action take by either US Division. Little was done to take advantage of the overlap the 1st Infantry Division had on the enemy facing the 9th across the road from them. 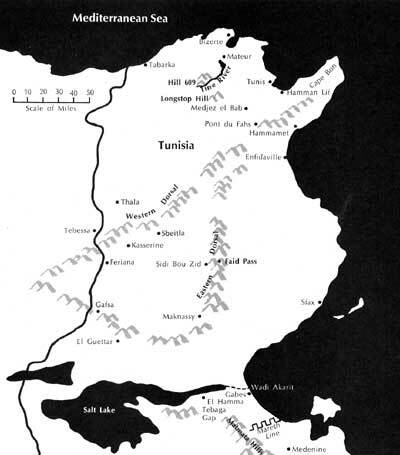 The 8th Army attacked and overran the Axis positions at Wadi Akarit on 6 April. On the morning of 7 April Benson Force was on the move again. It thrust through the positions of the 1st and 9th Infantry Divisions and the enemy forces and raced 20 miles down the El Guettar-Gabes road where it met the lead elements of the 8th Army at 1705. During its breakthrough it had gathered over 1000 prisoners. The battle of El Guettar was over.